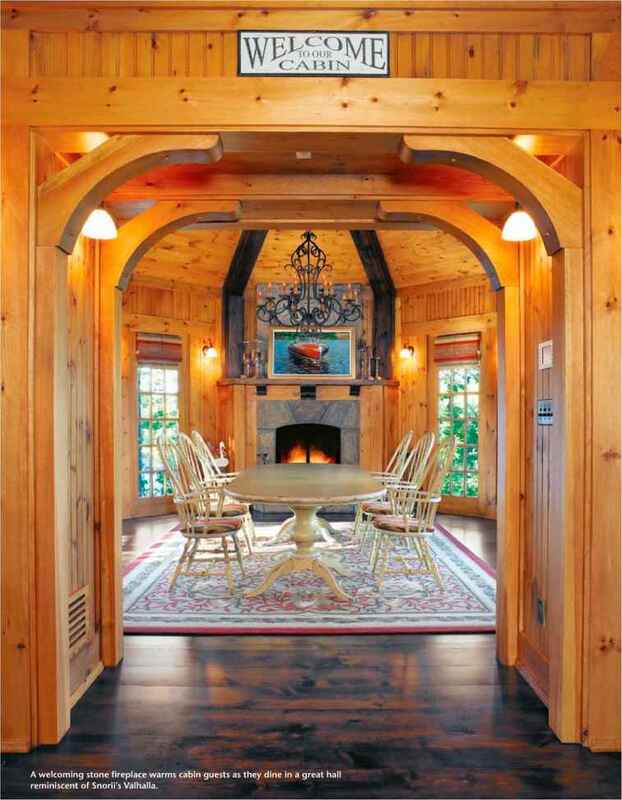 The great room's Quebec fieldstone fireplace ensures a cozy area in which to socialize with family and friends. 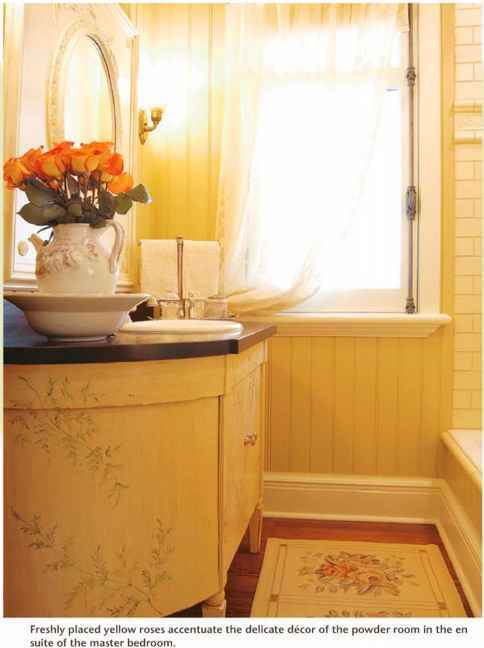 Freshly placed yellow roses accentuate the delicate decor of the powder room in the en suite of the master bedroom. 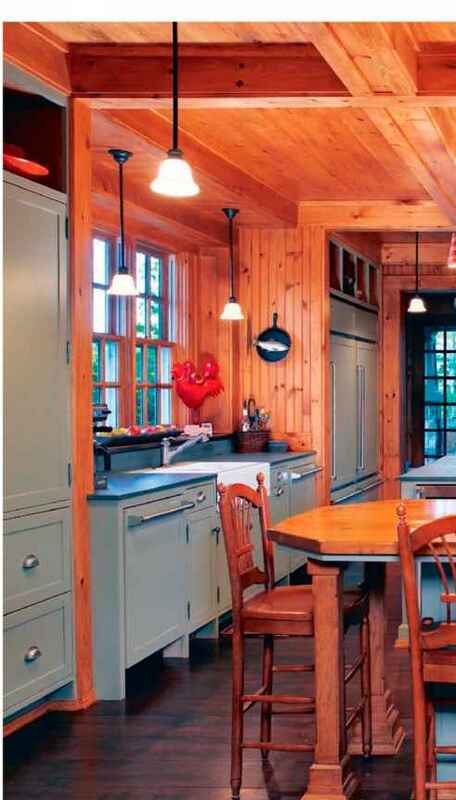 kitchen areas as a natural partition, an antique butcher block table stands as an entertaining servery. The rural lodge ambience achieved throughout by Lori Morris and Susan Firestone is exquisitely captured in the bedrooms. The children and their friends enjoy a bright, fresh room housing fun bunk beds constructed to a delightfully simple custom design by a Montreal craftsman. 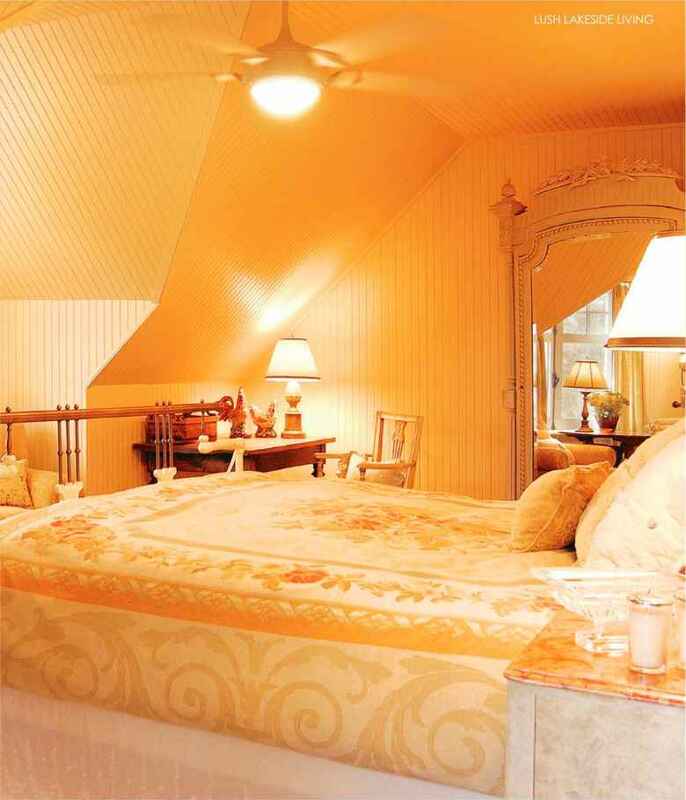 Meanwhile, the master bedroom is dramatically framed by a dormer ceiling accentuating the windows and linen drapes. A Scandinavian-style ceiling fan and light combination cools and illuminates this handsome bedroom, which like the children's room has beadboard-clad walls and ceilings. The bed itself is custom made, crafted from iron as another wonderful example of design influenced by enduring concepts from bygone days. The needlepoint-inspired carpet serves to enhance the Aubusson-designed duvet, a luxury touch adding a dash of regalness to the hunting lodge aesthetic. This whimsy is also flirted with in the form of the French bedside table - a lovely item of furniture, resplendent with a custom painted, antique marble OG top. The master bedroom's elegant custom made iron bed offers maximum comfort and high-end design. Also featured in this most chic of master bedrooms is an antique, single-door French armoire, plus two custom designed armchairs and matching footstools, covered with Chenille Damask fabric for ultimate relaxation. The master bedroom's ensuite bathroom is space captivating in its simplicity, with beadboard walls and subway tiles throughout the shower area. The powder room section contains a wood-topped vanity, hand painted with a delicate fern motif. On the vanity sits an antique pitcher and washbowl stand, which when originally unveiled presented freshly cut yellow roses. 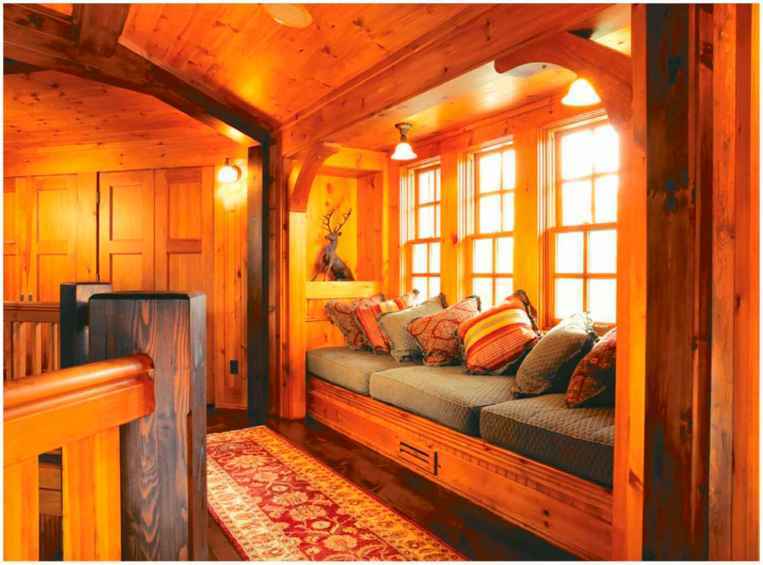 A magnificent location like the one enjoyed by this summer home is of course always best appreciated outdoors, a fact well catered for by the cottage's porch area. Essentially an outdoor room linked to the sitting area of the great room, it rewards with a spectacular panorama of I.ake Heney and ringside seats to her famed sunsets. 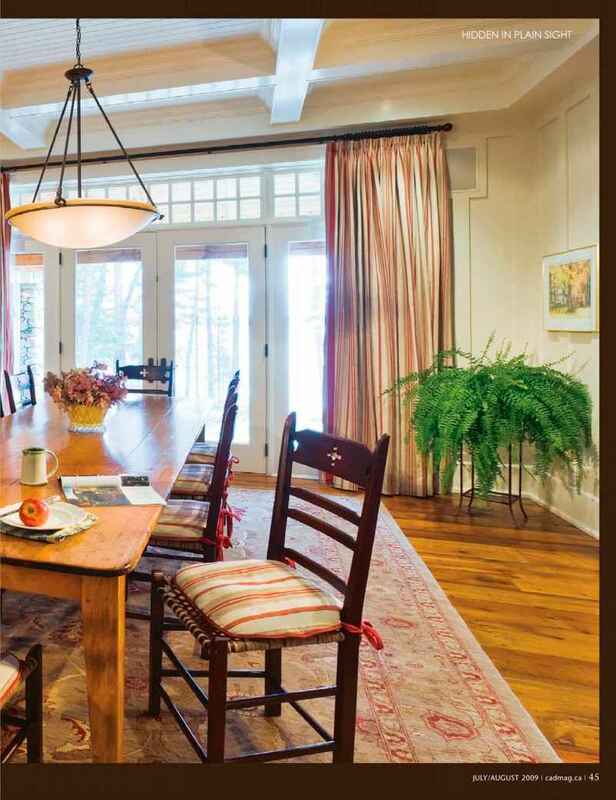 The owners and their guests recline on the dark green wicker chairs and chaises around the porch area to enjoy sunny days and moonlit evenings. Getting closer still to nature, Lake Fleney's changing moods can also be witnessed from the cottage's own custom built dock. Arcing out to the right from the water's edge to rest on boulders. This superb feature amplifies the wonder of its surroundings by providing a unique rostrum from which to view them. 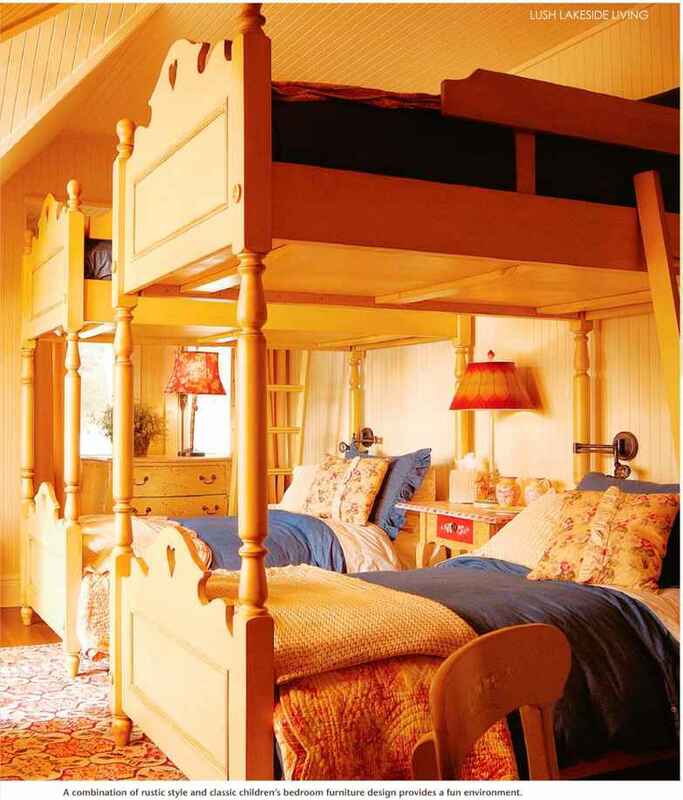 A combination of rustic style and classic children's bedroom furniture design provides a fun environment. The peaceful pastiche calms not just the human soul but the Canadian Shield's jagged geography. 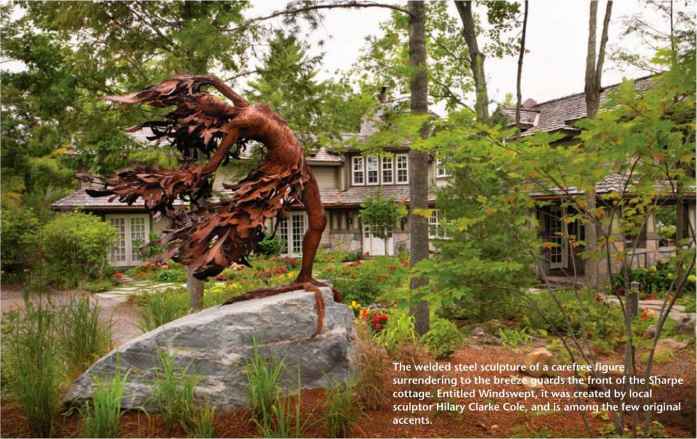 Delicate and ebullient, the contradictions of Ontario's Muskoka Lakes have seduced the psyches of fur traders, artists and industrialists for two centuries. The Muskokas provide balance to the frenetic pace of the pursuit of fortune that lights the candle of Toronto, 170 kilometres to the south. 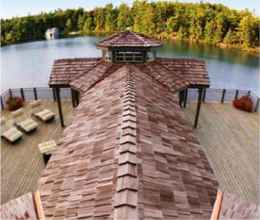 Generations of southern Ontario's establishment families have come to depend on the splendour and the stillness of the Muskokas to wash away the grime and noise. Toronto architect Rick Wink found his tranquil Mecca here about 15 years ago. 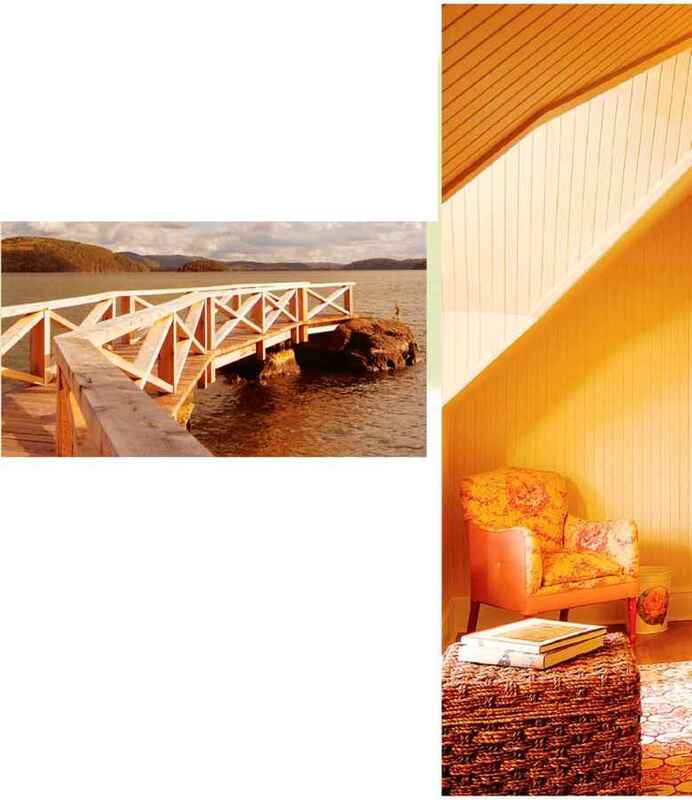 His friends Peter and Lydia Sharpe rented an aging 8(X)-square-foot cottage on top of a sheer granite precipice looking out over a soothing lake enveloped in verdant glory and serenaded by loons and swallows. (top) The octagonal great room features a second-floor gallery with plenty of restful alcoves to ride out the rainy days with a good book. 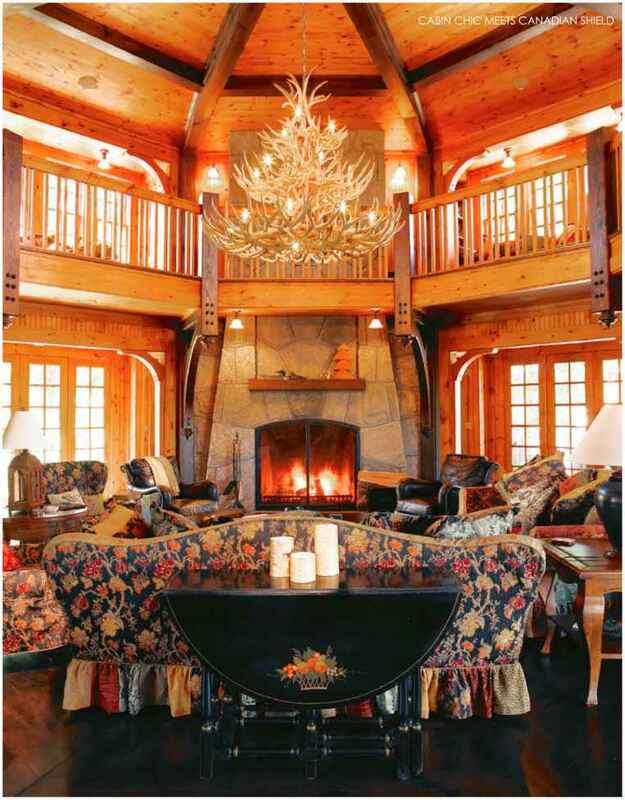 (right) The great room is decorated by the massive granite fireplace and a chandelier of clustered deer antlers. 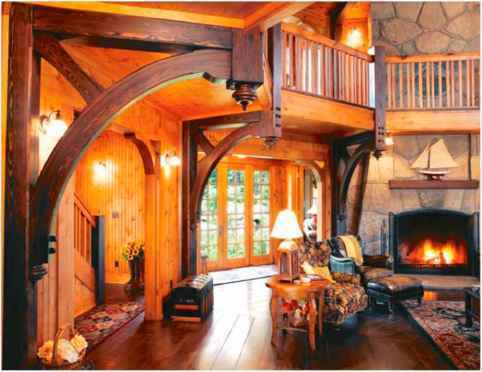 The cottage's cruciform design makes the great room, and its impressive hammer beams holding up the roof, the centrepiece of the cottage. driving in. Not so much for security, but just to see how much food to prepare. They are very gracious people. 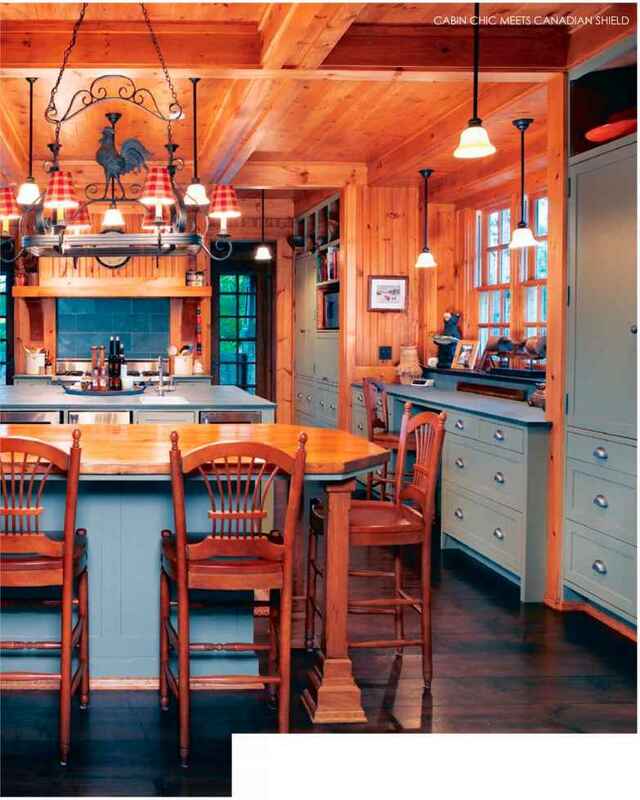 They love entertaining, and the house was designed around that," Wink said. Wink had the benefit of being intimately familiar with the site and being a close friend of the client for about 30 years. The 64-year-old architect began his career as an interior designer specializing in shopping centres and retail stores, but was driven to learn more about creating residential solace. He enrolled in the University of Toronto's architecture program in his 30s and started practicing in 1983.